“Social justice,” a term coined by the Italian Jesuit Father Luigi Taparelli D’Azeglio (1793-1862), appeared in an 1894 curial document and a 1904 encyclical. Later, Pope Pius XI (1922-39) made it part and parcel of Catholic social doctrine. 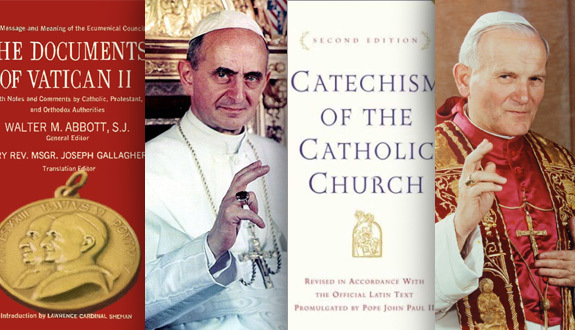 The three decades following John XXIII’s death witnessed further developments in Catholic teaching on social justice. In 1992, Catholic doctrine on social justice was set forth with particular authority when Blessed John Paul II promulgated the Catechism of the Catholic Church. The term “social justice” appeared three times in the documents of the Second Vatican Ecumenical Council (1962-65). In Nostra Aetate (1965), the Declaration on the Relation of the Church with Non-Christian Religions, the Council Fathers exhorted Christians and Muslims to “preserve as well as to promote together for the benefit of all mankind social justice and moral welfare, as well as peace and freedom” (no. 3). Six weeks later, in the Pastoral Constitution on the Church in the Modern World (Gaudium et Spes), the Council Fathers observed that “excessive economic and social differences between the members of the one human family or population groups cause scandal and militate against social justice, equity, the dignity of the human person, as well as social and international peace” (no. 29). The Council Fathers called for the creation of an “organism of the universal Church” whose role would be “to stimulate the Catholic community to promote progress in needy regions and international social justice”—in the original Latin, “social justice among nations.” Venerable Paul VI established that organism, the Pontifical Council for Justice and Peace, in 1967. The three conciliar references to social justice use the term in the context of “all mankind,” the “one human family,” and “among nations.” Pope Pius XI wrote about the importance of social justice within the life of a nation, particularly between employers and workers; following the council, the stage was set for extended papal reflection about social justice within the life of the human family, particularly between wealthy and poor nations. The teaching set forth by Our predecessor Leo XIII in Rerum Novarum is still valid today: when two parties are in very unequal positions, their mutual consent alone does not guarantee a fair contract; the rule of free consent remains subservient to the demands of the natural law. In Rerum Novarum this principle was set down with regard to a just wage for the individual worker; but it should be applied with equal force to contracts made between nations: trade relations can no longer be based solely on the principle of free, unchecked competition [in the Latin, "on the sole law of the free and unrestrained rivalry of competitors”], for it very often creates an economic dictatorship [i[in the Latin, "power to command, sovereignty”]Free trade can be called just only when it conforms to the demands of social justice (no. 59). 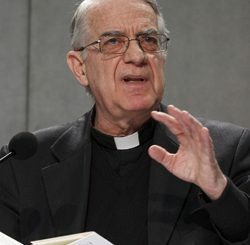 “By explicitly mentioning Bellarmine, one of the greatest theologians of the Church, in this context, in my opinion Paul VI wanted to give a strong signal of the importance of the issue of social justice within the history of Catholic doctrine,” she added. The term “social justice” appeared again in Pope Paul VI’s famed 1968 encyclical on the regulation of births, Humanae Vitae, in which he urged governments not to adopt population policies that violate the natural law. “No one can, without being grossly unfair, make divine Providence responsible for what clearly seems to be the result of misguided governmental policies, of an insufficient sense of social justice, of a selfish accumulation of material goods, and finally of a culpable failure to undertake those initiatives and responsibilities which would raise the standard of living of peoples and their children,” he wrote (no. 23).